Let's just put it out there: I don't have a full chest! In fact, my small B got even smaller after 9 months of breastfeeding (all you moms out there know what I mean, right?). And after all those months of wearing wireless sports bras, I am totally over the whole Victoria Secrets super-push-up-add-two-cup-sizes kind of lingerie. It's not like I really need the support (supporting what?!?) and it's not like I can fool anyone into believing that I've maintain my D-cup after I stopped breastfeeding, so why even bother? So I've been constantly in search of fashion-forward (and friendly, especially when it comes to summer wardrobe) lingerie. And I think I found the ultimate cool girl's bra: VPL Insertion W bra. They come in a variety of colour blocking combinations, they are athletic chic (which is a huge trend for SS10) and can even be worn alone! 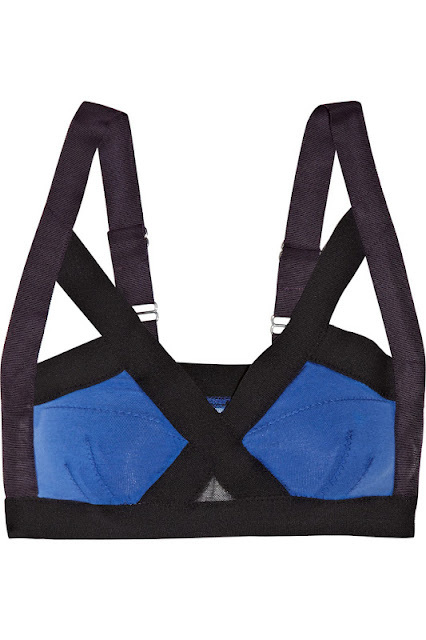 And p.s., the cobalt blue/blk one is even on sale on Net-a-Porter's international site!!! i really like them too.totally fashionable and super cosy.great post! I just found your blog and love it! I'm your newest Bloglovin' member. I'm so jealous you went smaller. I got bigger and hate it so much! These may be a good option then for me. Thanks.. going to check them out.